Lions Club President Hilary Kumnick, First Selectwoman Catherine Iino, 35th District State REp. James Crawford, COY Jim Lally, State Senator, 12th Dist. Edward Meyer. 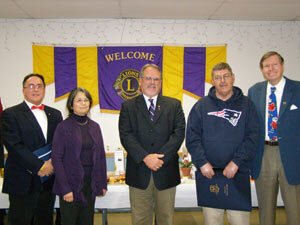 The Killingworth Lions Club has selected James H. Lally as the recipient of its Citizen of the Year award. The award is presented to a citizen of Killingworth who has demonstrated leadership in Community Service. Lally has "demonstrated saintly patience in serving on numerous town committees, including nine years on the Recreation Commission and eight years—and counting—on the Town Office Building Committee," First Selectwoman Cathy Iino noted in the town's proclamation. State Senator Ed Meyer read citation from the General Assembly declaring February 18 Jim Lally Day. Lally has also donated construction services to almost all of Killingworth's civic facilities, including the Ambulance Association building, Killingworth Elementary School, Rocco Reale Memorial Field; and the Town Office Building. He provided crucial material for the Killingworth Town Picnic, from flatbed trailers to bovine personnel for Cow Pie Bingo. Lally has also supported such activities as youth sports leagues, the HK Youth and Family Services Pumpkin Run, and the Lions Club Concert Series. Lally and his wife Pauline have lived in Killingworth since 1972. In 1985, he purchased the 200-year-old Skyline Farm on Bunker Hill Road where he raises Polled Hereford cattle for seed stock. Over the years he has donated the services of his construction company and equipment toward the building of the Killingworth Ambulance Association building, the scoreboard at Rocco Reale Field, the addition at Killingworth Elementary School, and the moving of both the Black Rock and Pine Orchard schoolhouses.